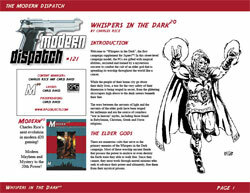 Welcome to “Whispers in the Dark”, the first campaign supplement for Supers20! In this street-level campaign model, the PCs are gifted with magical abilities, recruited and trained by a mysterious sorcerer to combat the cult of an elder god that is spreading its worship throughout the world like a cancer. While the people of their home city go about their daily lives, a war for the very safety of their dimension is being waged in secret, from the glittering skyscrapers high above to the dank sewers beneath their feet. The wars between the servants of light and the servants of the elder gods have been waged for millennia and are the source of countless “war in heaven” myths, including those found in Babylonian, Christian, Greek and Norse religions.